Perfect for smaller or odd shaped bathrooms, this single sink vanity brings a lot of style and functionality to the space. The dark black finish adds a bold touch to the modern design. 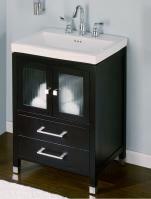 This deep tone is nicely accented by the decorative chrome hardware pulls and exposed hinges. The double door cabinet provides a nifty spot for stashing essentials neatly out of sight. The open construction of the bottom creates a shelf area that will be good for more storage or display of decorative items. The counter top and under mount sink are made of ceramic with a white color that pops against the dark finish tone of the base. 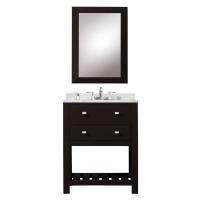 Material: This bath vanity is constructed of a combination of solid hardwoods and high grade medium density fiberboard with Cherry veneers. The framework of the cabinet is hardwood. In woodworking, veneer refers to thin slices of wood, usually thinner than 1/8 inch, and is glued onto core wood panels, such as MDF, to produce flat panels such as doors, tops and panels for cabinets. All hardwoods have been Kiln dried to ensure a stable product that will not expand, contract, or warp.